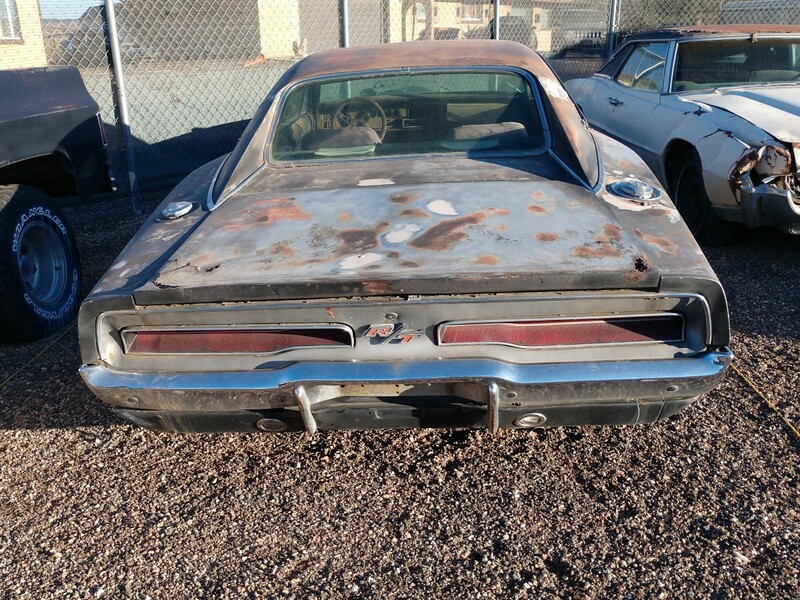 We’ve seen lots of Chargers on this site in various states of dilapidation. 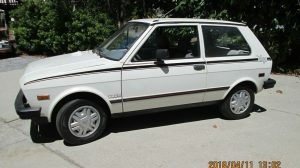 The seller says this one was parked 30 years ago by the original owner due to broken torsion bars. How does one break both bars? Did they try to pull a General Lee? 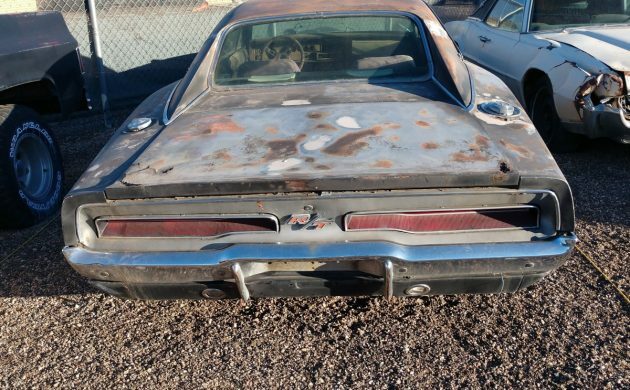 The seller says he purchased the Charger a few years ago. Replacing the bars is no big deal, so why doesn’t he fix it? The only answer that comes to mind to explain why they parked it and the seller doesn’t repair it is that there must be a lot more damage. You’ll find it listed on eBay in Keystone, Iowa. Bids have reached $25,000 at this time and the reserve has not yet been reached. Someone took great care of this car for 20 years and it appears it was at least repainted before it was wrecked and parked. I don’t much like the color, but other than the droopy nose this looks like a really nice car. And then there’s the price. This appears to be a beautiful car, if not an original car, with unknown suspension damage. It does not run and the engine is apparently seized. 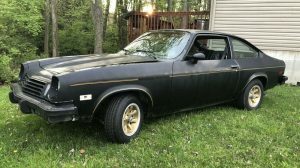 It’s not a Hemi or even an RT but a base 383 car with an automatic transmission. There are nice original Chargers out there that run and drive for this price. Besides being original is there anything special about this Charger? The interior looks really nice from here. It might clean up nicely. There’s no sign of rust in the usual places. The dash looks really nice from what we can see. Somewhere under all that mud rust is the 2 barrel 290 HP 383 backed by a 727 automatic transmission. There’s no AC or power anything. Does it look like it’s been repainted? 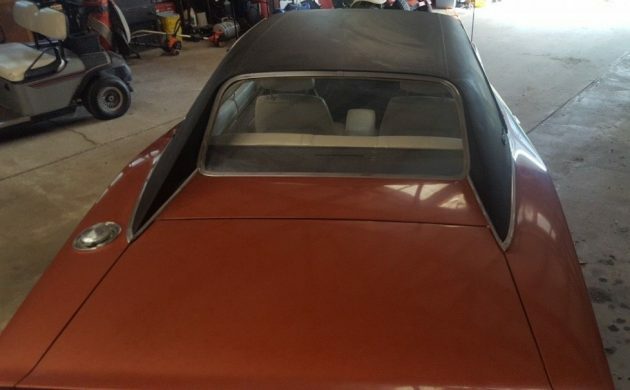 The vinyl top really does look pretty nice with no signs of rust around the edges. If I had to guess, I’d say this car was somewhat restored after about 20 years on the road and then someone charged a little too hard and pranged the front suspension. Repairs would be extensive so they put it away. The pictures are very selective and don’t show the right side. I’m thinking if you put it on a rack you’d discover some interesting measurements. I’d love to see a picture of the front suspension. 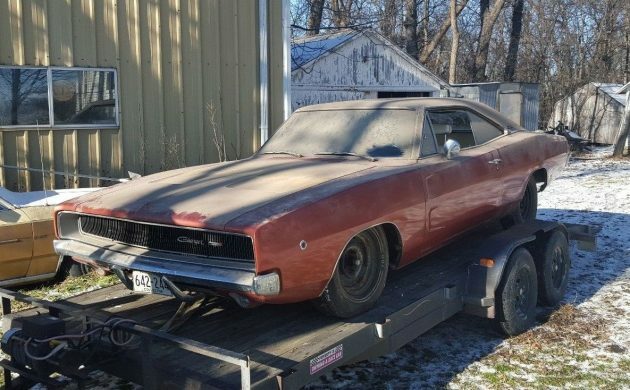 Can this Charger be worth even the current bid? To sum up the situation, it doesn’t run, the engine is likely seized and there is likely serious front suspension damage. Aftermarket clips with modern suspension and steering are an easy option but the car itself might be seriously tweaked. This is a very basic car with few options. It appears to have been somewhat restored before it was wrecked and stored. 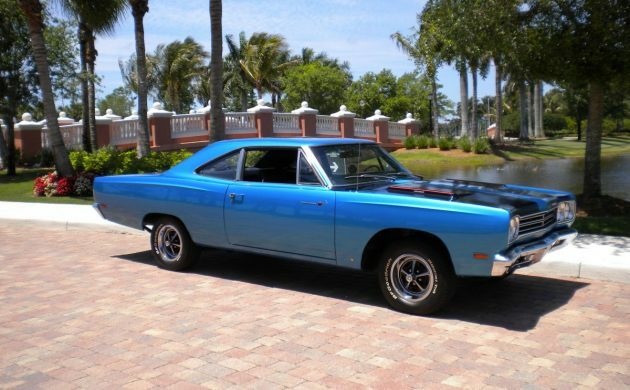 I’m really curious to hear from our Mopar readers to see what I have missed. Is there something special about this car? Why are folks bidding so much money? They are bidding on the shiny paint. Good luck to them, if it really is rust free why wouldn’t the seller go to the effort to get it on a lift? It would pay off when the auction ends. Ride that wild shiny paint…..
It’s what the Knights of old called their horse.. This is nuts. 30K will buy you a brand new car with a warranty that is already drive able,, and most of all, will not make your wife divorce you vs you buying a heap like this. Your brand new car will run circles around this and can beat it in a straight line too. How long will this madness go on? People, if you think you will make buck flipping this, think again, those days are almost over. The time to get into any bubble is when it is just starting to inflate, not when it is so stretched that sheer will is all that keeps it from exploding. 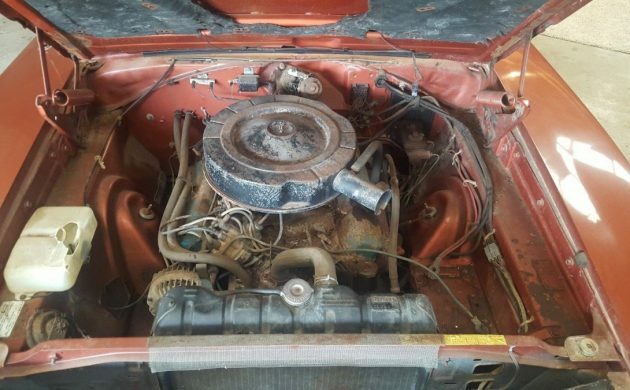 Gentlemen I found a 68 like this with two gas caps on rear quarters aposing each other. Any idea why there are two? Extensive damage to the front suspension, seized motor and 28K not from this guy. 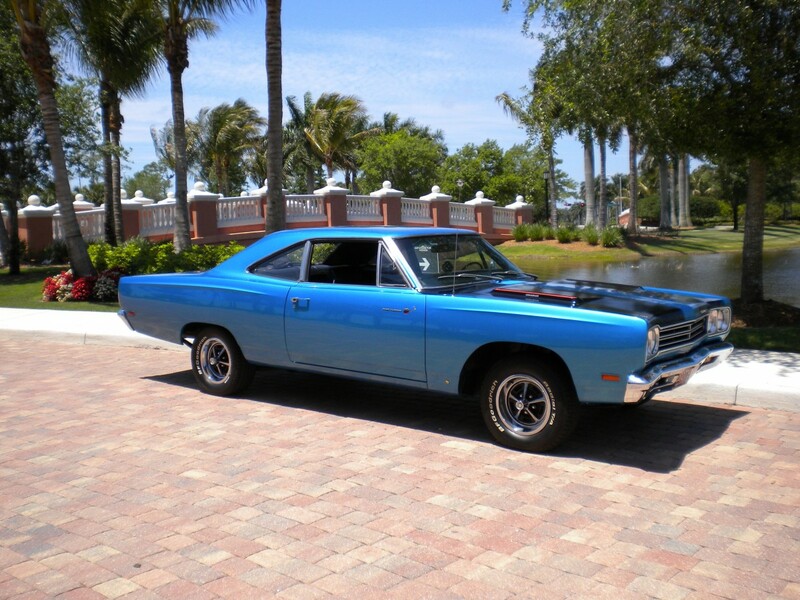 Mopar or No Car, I say No Car in this case. Barrett-Jackson Syndrome goin’ on too. Hey seller, this may be just a totally goofy idea but, how about showing a picture of the broken suspension? Seems like it would be of interest to a perspective buyer. I could be wrong…. it looks like the zanies are bidding like crazy. You’re exactly right JW! All these bidders escaped from the looney bin at once!! Maybe they think it is a Porsche 356! Quick, some call Adam W!!!!!! Win the bid. Yank the 318 and drop in a Hellcat crate! It’s clearly a big block with the distributor in the front. I don’t get it. That price for this car is ridiculous. Maybe it was jumped in a Pukes of Hazzard episode? Regardless, this is worth two of my mint low mileage E36 M3s. I’ve got a line on a Focus SVT for $2,500 but not sure I should spend that much disposable income on it. I truly am a “poor man” hobbyist now, and this does not fall into my wheelhouse. GLWTS. Thanks all for your comments. I thought I was missing something. I guess bidders just want to believe. $28.5 k and the reserve isn’t met. Makes me think something fishy is going on…or crack is cheap in Iowa. Maybe value has a historical basis. Original owner may have been Barnum or Bailey. 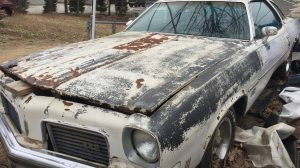 With all that unknown info.It’s like someone with bucks is going to buy it and take it to a restorer.So 5 thousand plus or less.Though if people are throwing 28,000 at you.Sell it and buy a new/used car or restore another with completion.Or take the money and do whatever you want.I just hope it’s not spent on stupid stuff though that’s your choice. Let’s see here – we have a car that’s sat for 30 years with a broken suspension, repainted, had mice in it and it doesn’t run. Having lived near where it is located, if it’s a local car it’s likely seen it’s share of snow and road salt. If it’s local it probably came out of Cedar Rapids, Waterloo or Iowa City and you can find your share of speed bumps in any of them (as in broken torsion bars). 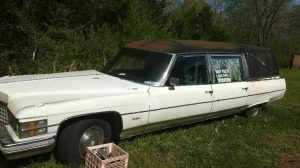 The body looks good but it’s going to take a lot of $$ to get that one back on the road so I expect the purchaser would be under water on this one fairly quick with hidden rust and structural damage. If I’m wrong correct me but this car should have a torsion bar front suspension. In the day (always wanted to say that), we put the nose low for drag racing. The “California rake” came on in the 50s and never went away…. Easy to do just by adjustments. Torsion bars are probably not “Broke.” But the mounts are probably rotted. Yes rotted mounts (torque box) on the rear of the torsion bars were a common issue with those, many sold for scrap 20+ years ago. A huge gamble without photos. The speedo goes to 150 MPH. With the 290 HP would this car make it to 150 ? I’m sure my new 68 RR with the 335 HP did. Pretty crazy looking back on all of it. 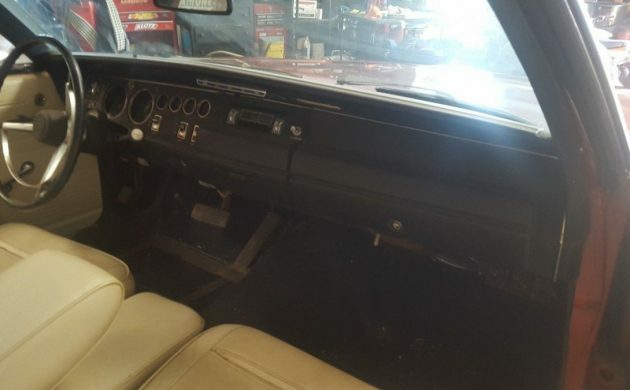 I hate the high prices for basically a wanker of a charger, yeah outside of the front end problems it looks nice, but it is not special, not nearly 30,000 dollars special. I don’t know. Do people with a lot of money just toss 30 large around without checking a car out? They usually aren’t stupid with it, even if it’s not a large sum to them. Maybe, but I gotta believe someone’s in the know about this one. But who knows? 29 grand for this ? And no pics of underneath ? That new car is not a ‘68 Charger! Yeah, the price might be high, but what a handsome machine. Great colors and not all of them were purple R/Ts. Looks better than most sub $30K Chargers. If money wasn’t an issue, and I was looking for one, this would be an option. If the seller wants top dollar, he should fix the torsion bars first and give more detailed pictures and description. Approach this car with caution. I have had SEVERAL early Chargers with one or both front torsion bars broken that looked just like this. For some reason, when these cars sat perfectly still for long periods of time, the thick torsion bars would literally just snap from metal fatigue. Weird, but very true. They would snap about a foot from the rear mount. On the ends you could see where the metal fatigued and it looked like it was from the way the bars were originally forged. Some of the stock b body torsion bars had a tendency to just snap. I had a 76 charger that had one snap off sitting in the driveway on a Thursday and the other one let go on Friday. Always replace with HD bars. OK guys time for the real answers. I just emailed the guy thru eBay and he sent me pics of the underside. Believe it or not the bottom of this Charger looks pretty good. Lots of surface rust as expected but not bad. The torsion bars are both broken about 6″ from the front NOT the back as some of you have said. The front end looks clean and the ball joint boots are not broken. The exhaust pipe is cut and I can’t explain that. It will need some love but can be restored in my opinion. 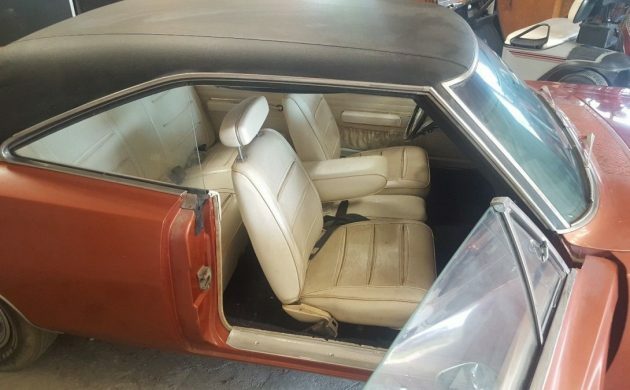 If I had the time I would buy the car as it sits, strip it, and rebuild it with a Current Factory 392 Hemi Package with computer and 6 speed Tremic trans. Install coil over suspension, Power everything and make it so it could be driven like any new car today with all of the Bluetooth stuff etc. 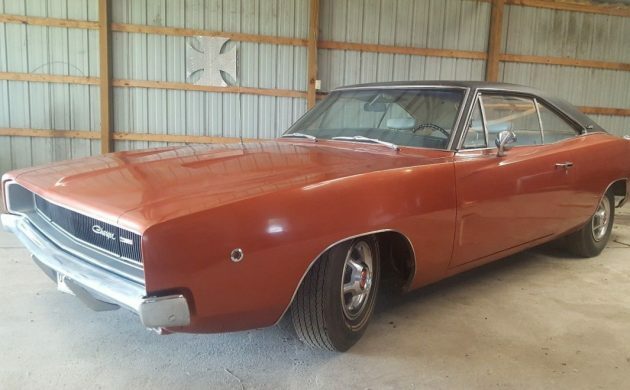 I have restored several cars and though this may seem a crazy price, you are getting a good foundation to start with and 1968 Chargers are the most sought after of all the years that they were built. Well OK guys time for the real answers. I just emailed the guy thru eBay and he sent me pics of the underside. Believe it or not the bottom of this Charger looks pretty good. Lots of surface rust as expected but not bad. The torsion bars are both broken about 6″ from the front NOT the back as some of you have said. The front end looks clean and the ball joint boots are not broken. The exhaust pipe is cut and I can’t explain that. It will need some love but can be restored in my opinion. $28K? I sold this one for $25K….It was pretty nice! Am I missing something? The link to the ebay ad shows a current bid of $10,000. Why is everybody saying $28K. So…. something wrong with the bids? They were all canceled. There are only 4 bids now. I didn’t look at the bids earlier, but if there were only a couple bidders and the high bidder canceled his bid then all the out bids are canceled.